From the northernmost point of the trip, Powell River, I took a ferry to Vancouver Island and since then I'm heading south. 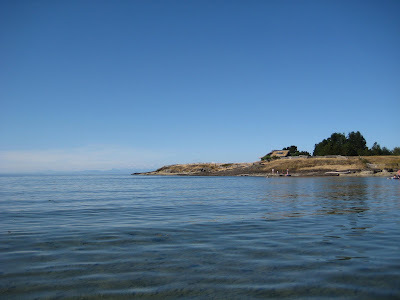 I took a side trip to the beautiful Islands Denman and Hornby. I knew that they, especially Hornby, are also known as Hippie islands, as lots of artists etc. have settled there. I also heard that it is probably not a problem to ask a local if I can pitch my tent on their meadow next to some trailers. So I came to the islands, knowing that there were also campsites as a backup, but secretly I was hoping to be invited for camping by some Hippies. So I cruised across the first island, Denman, watching out for Hippies, but they were not standing on the sidewalk waving to me, as I had imagined. Actually, nobody seemed to be there, after all cars had vanished from the ferry dock. I entered some private drives, also those that had signs pointing to 'Art Galleries', 'Pottery', 'organic food' and so on, nobody there. I constantly watched out for potential sites for wild camping (no bears on these islands! ), but there was not much that couldn't be seen from the road. And all these private meadows looked so great! 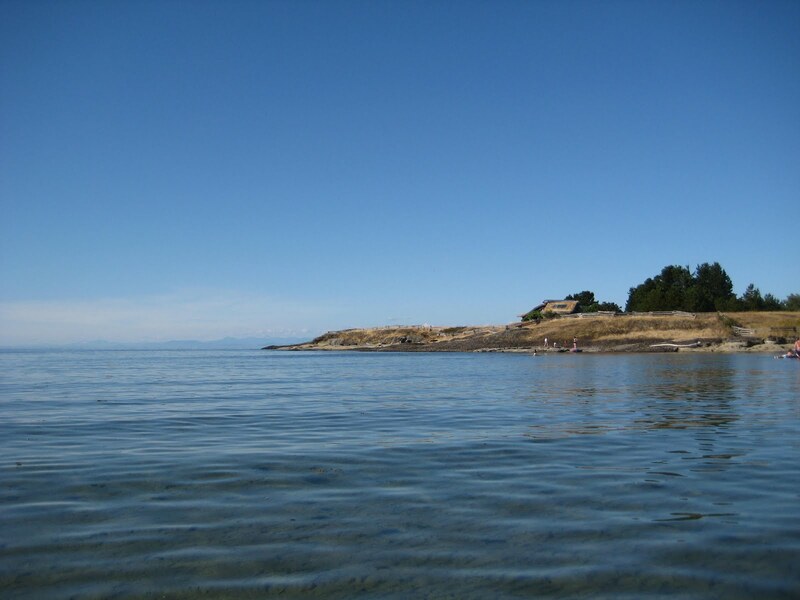 I tried it on the second island, Hornby (I still had the option to take the last ferry back to Denman, to the Provincial Park campsite without drinking water or showers...). Hornby was pretty much like Denman, it was really idyllic, but I could not enjoy it before having solved this accommodation problem. Not far from the ferry I discovered a private campground (of which I didn't know before). I entered, just to ask how much it is for a night. The man was friendly, but the price was 32 $ (22 Euro). He saw me hesitating and asked "Too expensive?" "Hmm, well, yeees, aehm,...." And then a miracle happened: He told me, that he couldn't give me a site for free (now I thought he would make a discount), "... but we have a backyard here ...". 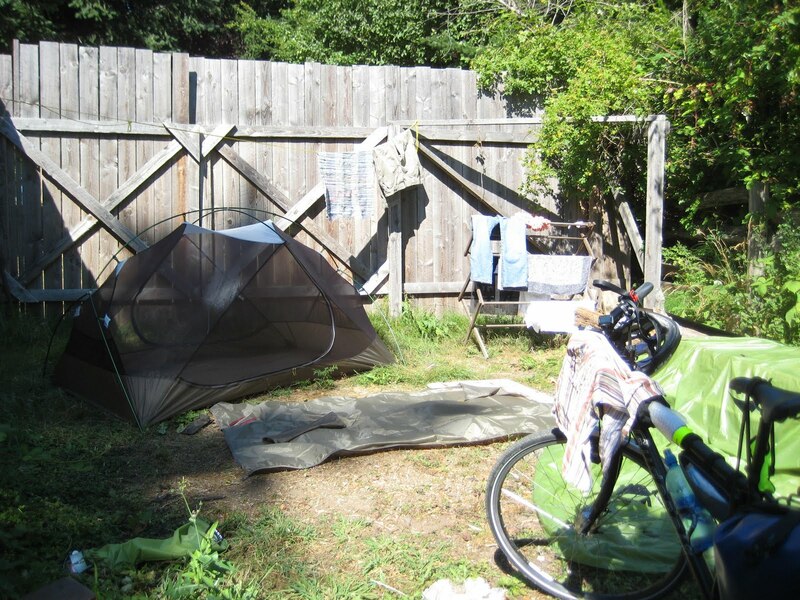 He showed me the backyard and told me that he lets people camp here from time to time if they are stuck on Hornby Island when they have missed the last ferry and all the campsites are full. And he offered me this place for free! Blackberries included. The place was perfect. Enough space for the tent and privacy because of the surrounding fence and bushes. He saved my day. The rest of the afternoon I explored the island without heavy luggage. Even saw some Hippies eventually. It is beautifully quiet and idyllic. Da hast du aber Glück gehabt :) Und es gibt Sonne :) Wie warm ist es denn in Kanada grade? Kannst du da baden? ?